Ah, the signs and sounds of spring. Flowers are blooming, birds are chirping, and the “I’m hungryyyy!” afternoon singsong begins to play more often. Kids home from school seem to want to snack non-stop. During last week’s spring break, I directed the girls towards the bowl of fruit and the beautiful mangoes I had just purchased. While prepping for a recent post on making a variety of guacamoles for a guacamole bar, including a pineapple mango guac, I thought about another favorite mango recipe “mango on a stick.” It was a childhood treat, especially during trips across the border into Mexico, where it’s served with a sprinkle of lime, salt, and chili powder. Sweet and refreshing, mangoes are rich in vitamins A and C, beta-carotene, copper, potassium, and fiber. 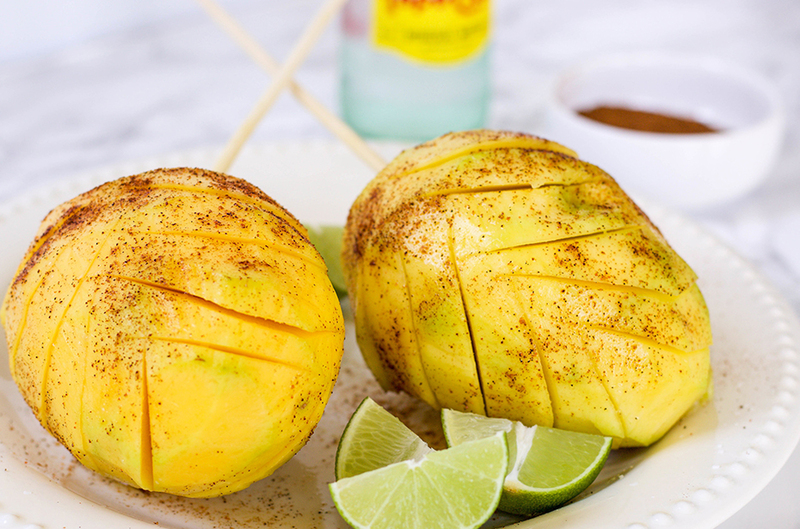 And, when served on a stick, mangoes become fun to eat and kids of all ages (ahem) will want to bite into one, so these are also great for an outdoor party. This isn’t really cooking – it’s peeling and assembling, but still, the end result look is cool – especially when you carve in some mango “petals” – and tastes even better. Skip the optional spices with the younger set and be careful, ensuring they sit under a watchful eye while enjoying their treats on wooden sticks. For toddlers, take it a couple of steps further and consider using the stick trick to make the slicing and dicing easier. Cut off the ends of the mangoes. Place cut side down on a cutting board and insert the chopstick into or close to the pit. 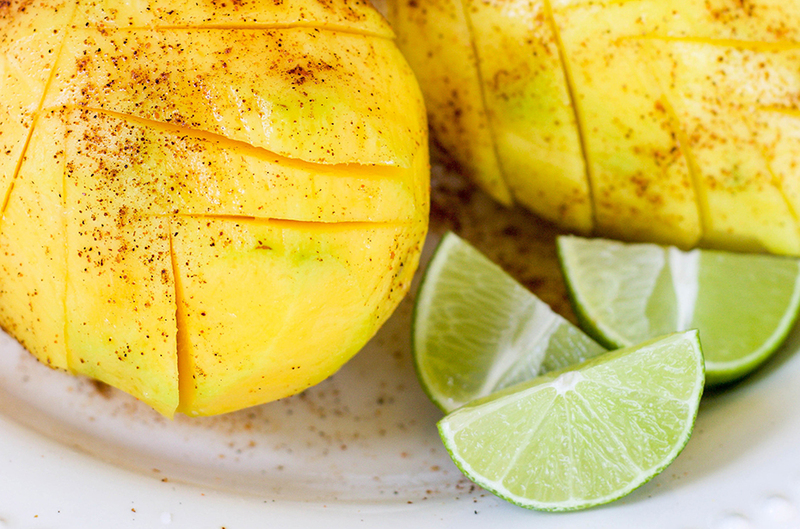 Using a paring knife, carefully peel each mango. To make the “petals,” begin at the bottom, making slices at a downward angle, towards the pit. Make about 4 slices and repeat twice for a total of 3 rows of petals. Repeat with each mango. 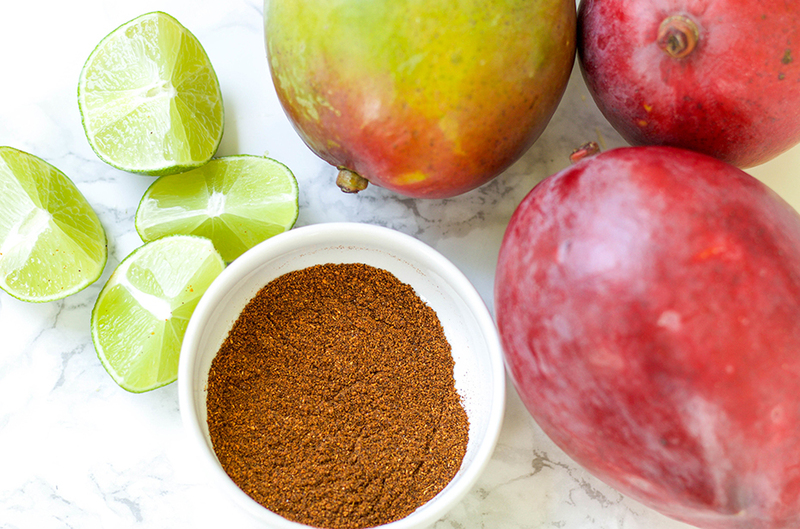 For authentic Mexican street flavor, add a sprinkle of lime (making sure to get juice between the petals), along with a touch of chili powder and a little salt. Even if you're not serving on a stick, using a chopstick makes slicing a mango so much easier.